Poll results: Which features are most important to you? A few weeks ago I decided to start running the occasional poll on this site. I completely forgot to save the results of the first poll, which asked which upcoming low-cost ultraportable you were most interested in. If memory serves, the top answers were the MSI Wind and the Asus Eee PC 901. Both of these computers should get a proper unveiling tomorrow at Computex. Over the past week I asked which features are most important in a subnotebook. The top choices were overwhelmingly size/weight and battery life. 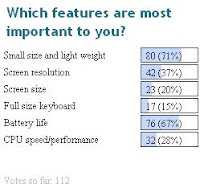 It looks like most of the folks who took the time to respond to the poll are willing to sacrifice CPU speed, a full size keyboard, and even a decent screen size and resolution in order to get a tiny laptop that you can use for a few hours. Make sure to participate in this week’s poll on processors. Remember, if you don’t vote, you can’t complain. Or rather, you can complain all you want. But your vote won’t be counted in the poll.